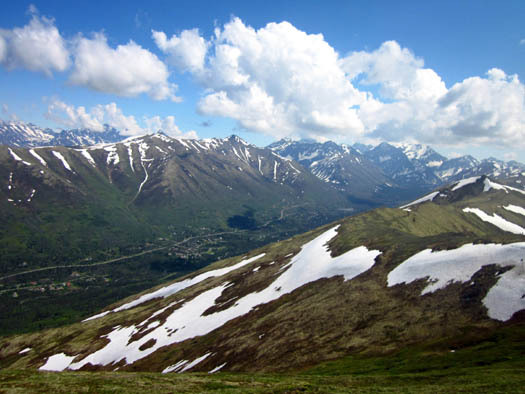 why not make the Mat-Su your adventure hub? Plan to stay awhile . . ."
Today we made our decision re: whether to visit places of interest in the Mat-Su Valley on day trips from Anchorage or to spend a few days next week at another campground in that area. 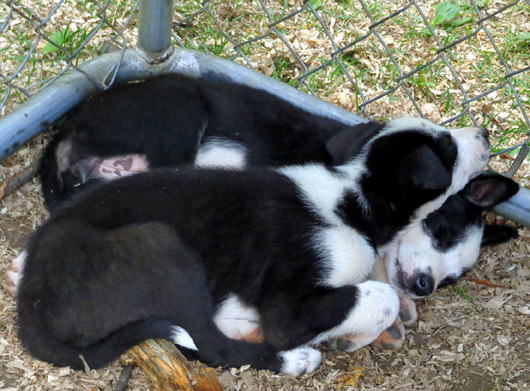 Snuggle-pups at the Iditarod Trail Sled Dog headquarters -- aren't they sweet? 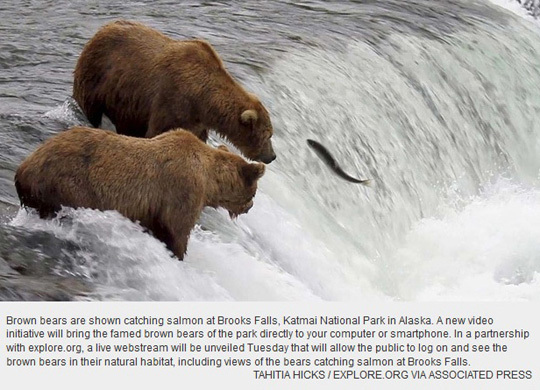 I'll also share a link with an article about the new "bear cams" set up at Katmai National Park so you can watch grizzlies catching salmon this summer -- without having to travel to Alaska! It was overcast this morning when we got up but it didn�t rain today. We hung around the campground in the morning, doing laundry and more trip research on our computers as we waited to see what the weather was going to do. After lunch it was still cloudy so we decided to take a drive instead of riding our bikes on one of the greenways. 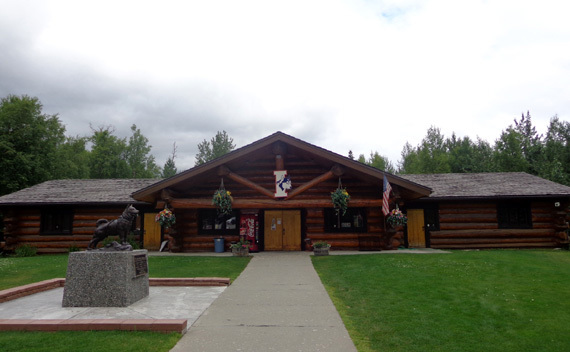 I thought it�d be a good idea to check out some of the public and private campgrounds in the Palmer-Wasilla area to see if we'd like to stay at any of them for a few days before we go up to Denali National Park. If not, we'll just do one or more day trips from Anchorage. The green and white area in the upper left corner of the map is part of Denali National Park & Preserve. The Mat-Su Borough (like a huge county) covers even more territory to the west and north than is shown on that map section. Most of what we'd do on day trips from Anchorage would be in the Palmer-Wasilla-Willow area. There are several other things we'd like to do/see in the Valley while we're in this part of the state, such as visiting Independence Mine, driving up to Hatcher Pass and hiking in the Talkeetna Mountains, seeing the Iditarod Sled Dog Museum, going to a farm and/or farmer's market (this is the fruit and veggie capital of the state), visiting some museums, and touring the original Matanuska Colony. 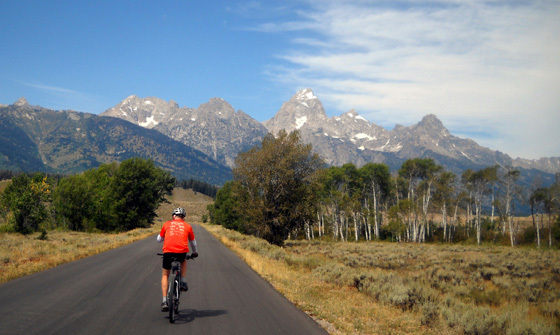 We're not sure if there is enough to keep us busy for several days if it continues raining, however, because cycling, hiking, and most of the other activities listed above aren't a lot of fun in the rain. When I'm hiking in the mountains somewhere new to me I want to enjoy the scenery as much as I want the exercise. 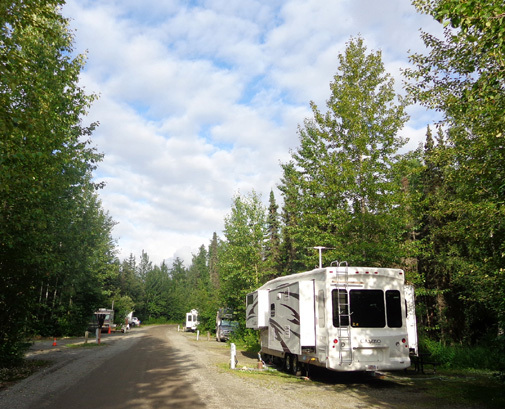 I figured if we found a nice public or private campground in the Palmer-Wasilla area we could spend some time relaxing there before we go on to Denali National Park on August 5. My intention wasn�t to start doing any of the activities in the Valley today, just look at campgrounds. We did more than that this afternoon, though. As soon as we got a little north of Anchorage we could see some blue sky to the east, west, and north. Yay!!! It started warming up a bit, too � low 60s F. That�s an improvement over the last few days. The average high temperature in Anchorage is 65 F. in July but this year so far the average has been only about 56 F.
The locals are not happy with the chilly temps. Visitors aren�t too thrilled, either. At least we aren't sweltering like many folks are this summer in the Lower 48. 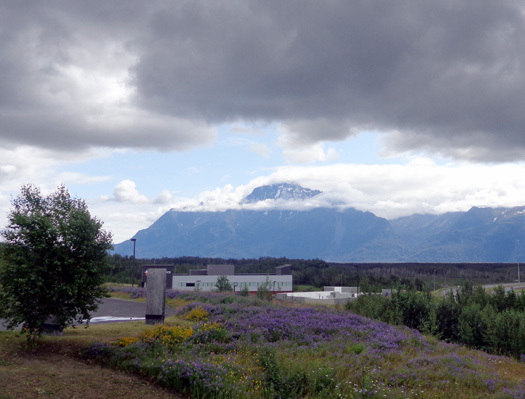 From our campground at JBER in the northern part of Anchorage it didn�t take too long to pass the exit on the Glenn Hwy. 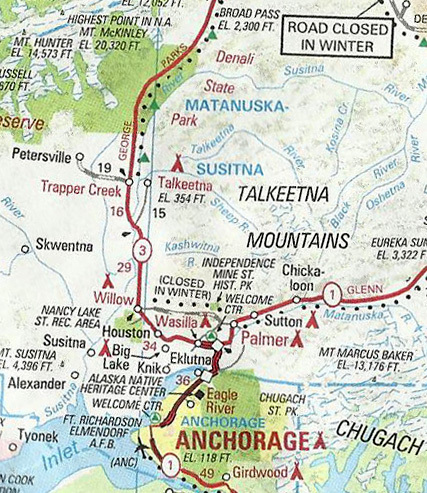 where we got off for Eklutna Lake last week and to reach the intersection with the Parks Hwy., which goes north to Denali NP and Fairbanks. 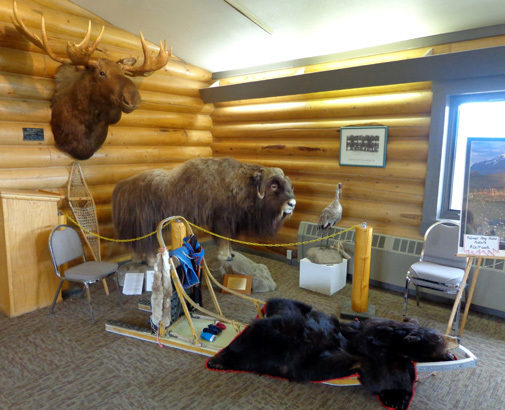 We got some additional information from the visitor center staff about farms to see, Independence Mine, and the Iditarod Dog Sled Museum. I already had most of the brochures we need for the Mat-Su Valley. 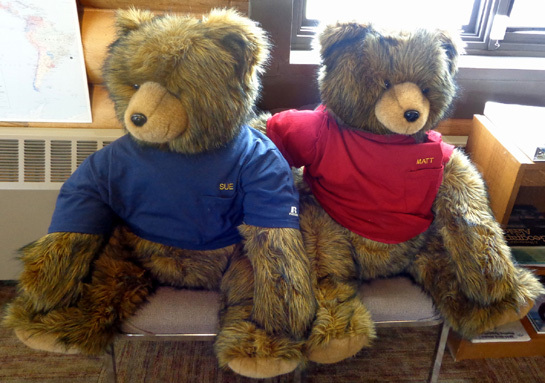 There were two large stuffed teddy bears named �Matt� and �Sue.� Of course, I had to take a picture of them! I had a loop route selected that would take us by about eight different campgrounds. 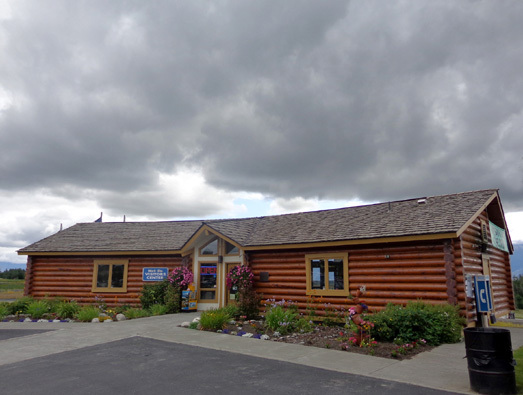 When we were hunting for the visitor center I missed the turnoff for the first one, Big Bear RV Park, a modern full-service, big-rig private campground on the Parks Hwy. between Palmer and Wasilla. Jim didn�t want to go back (it sounds like a nice campground but it's rather expensive) so I directed him to the next one -- Lake Lucille Park, managed by the Mat-Su Borough. It is similar to a county park in the Lower 48. 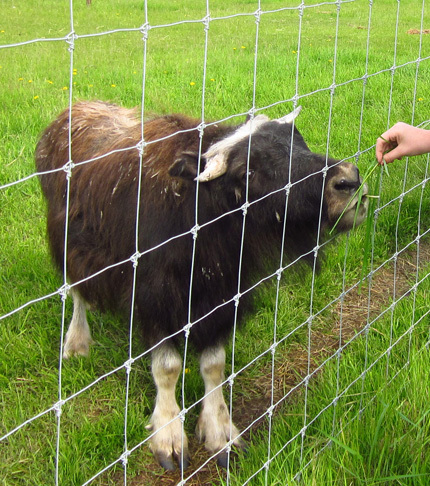 It is two miles west of Wasilla on Knik-Goose Bay Rd. 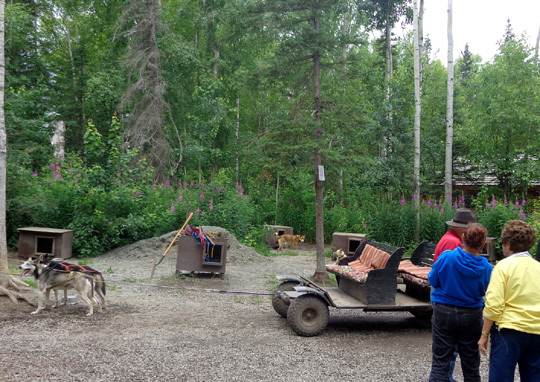 Mike and Terri Church, in their popular Traveler's Guide to Alaskan Camping book, call this campground "one of the best deals in the Matanuska Valley." Based on that, we were surprised there were so few RVs camped there. We though the campground was pretty scruffy-looking. I didn't even take photos. There isn�t enough room at most of the sites for our rig (either too short, too narrow, or trees prevent backing in). We did find half a dozen sites that Jim could probably maneuver into. The bathrooms are vault toilets with no water and we couldn�t find any potable water in the campground. Even for only $10 we weren�t interested. Fortunately it still opens and closes OK so we don�t have to get it fixed until we get back to the Lower 48 in the fall (more options and cheaper to replace it there). I wasn't all that concerned when we realized it's still serviceable. 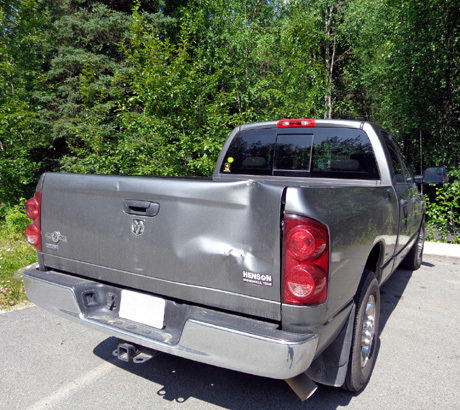 Jim feels pretty bad about the damage but it gives him a good excuse to get a lighter-weight louvered tailgate that might improve our fuel MPG. The short road off Knik-Goose Bay Rd. 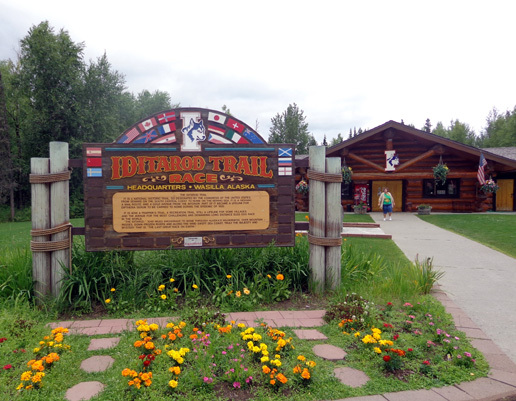 to the Lake Lucille Campground goes right by one of the entrances to the Iditarod Trail Sled Dog Race Headquarters and Museum. Jim suggested we just go ahead and visit it since we were there. That was a great idea; he didn't have to convince a dog-lover like me. 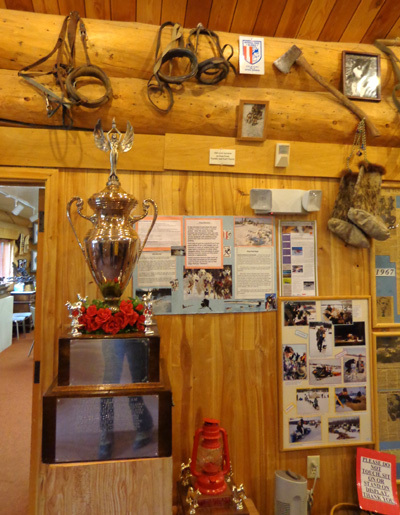 Unlike some of the private dog mushers' kennels in Alaska that are open to the public, there is no admission fee to visit the race HQ and visitor center/museum. It is open every day in the summer. There is a fee if you want a cart ride (or sled ride when there is enough snow). Sled dogs love to work! This is one way they stay fit when there isn't any snow on the ground. 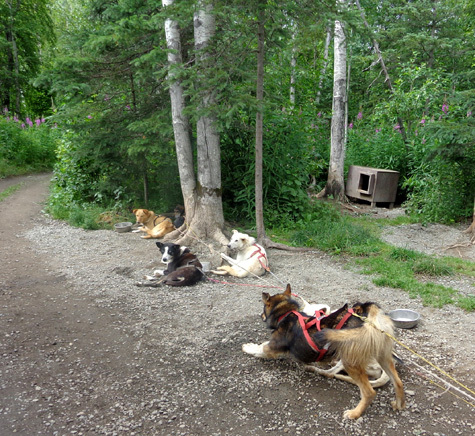 As you can see, sled dogs don't all look like black-gray-white Siberian huskies and they aren't as big as malamutes. They come in all colors and most are very lean this time of year. By now they've mostly shed their wooly undercoats. 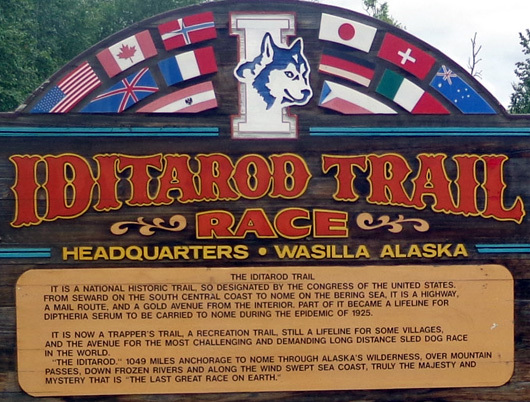 This year's Iditarod sled dog race in early March was the event's 40th year. The historic trail, considered to be America's "last great gold rush trail," is 100 years old. 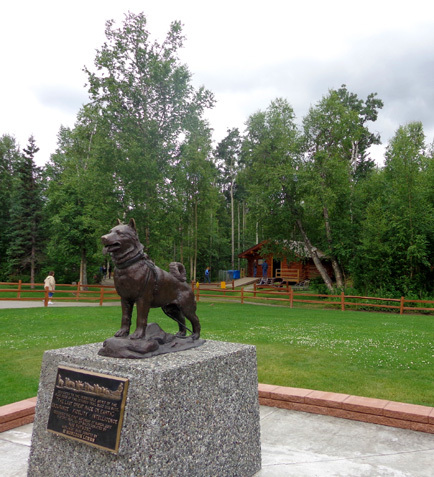 The race was begun to celebrate and revitalize interest in the Alaskan sled dog and the role it has played in the history of the North so it will remain a viable part of Alaskan culture in the future. In the museum we picked up a copy of the official 2012 race guide, looked at all the photos and displays about the history of the race, and watched an interesting film about the training and care of sled dogs. It helped Jim's mood to play with the puppies and pet the dogs on our way out. By the time we left he was in better spirits. It's a well-known fact that dogs can be therapeutic! It took longer to find the next campground but we got there OK after plugging the park into the GPS � Finger Lake State Recreation Area. It's described in the Alaskan Camping book as being a popular destination for fishermen who want to catch rainbows, grayling, and silver salmon. This campground suited our needs even less than Lake Lucille. There are 39 camping sites. Most are back-ins in wooded sites we wouldn't be able to access with a 36-foot 5th-wheel because the maneuvering room is too tight. The only place we could park is in back-in sites in a large gravel lot near the lake. 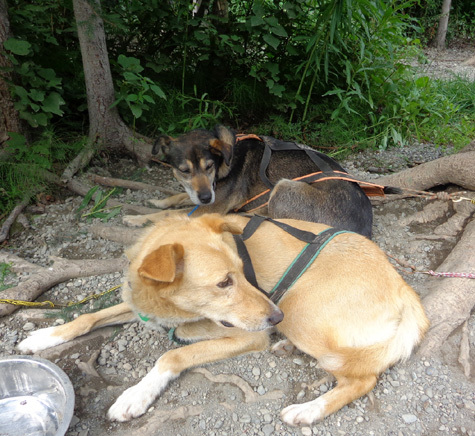 There were a lot of potholes getting into the campground and the whole place just didn�t appeal to us. I'm sure there are other people who would love it. Sites are $15/night with no hookups. Potable water is in a great big plastic tank = a questionable source of drinking water since we didn't know if or how it had been cleaned. We didn�t go into the vault toilets. That was when Jim suggested just staying longer at JBER and driving up to Palmer and Wasilla to do the things we want to do there on one or more day trips. Although there are several other public and private campgrounds in this general area, we quickly tired of looking. We're too comfortable at JBER! I�m fine with that. Staying there almost three weeks is easier than moving, we have a great site with full hookups for only $21/night (half the price we�d pay for a private campground with similar amenities), we have plenty of places to hike and ride in the Anchorage area, we know our way around the city, stores are plentiful, we can do a variety of day trips to the north and south of town, we have good TV and internet connections, Jim has the library on base, etc.,etc. Now we just have to weedle our way into staying another five to six days beyond the second week we just paid for. That shouldn�t be a problem as long as there is still at least one space available at 1 PM next Monday. There are several folks who�ve been here all summer by timing their extensions judiciously. Tomorrow I plan to take the truck to Eklutna Lake so Cody and I can hike Thunderbird Falls (Glenn Hwy. exit 25) and Twin Peaks (exit 26 + back 10 miles to the lake where we parked when we rode our bikes out there last week). This week I wanted to do a 5�-mile hike along the river from the Eagle River Nature Center to Eagle and Symphony lakes but there are warnings in that vicinity now after a resident was mauled by a brown bear (grizzly) on private property where he was hiking with his dog a few days ago. He�s in critical condition. That�s the third or fourth bear mauling in the Eagle River area this summer. I haven�t heard of any bear problems at Eklutna Lake, although bear encounters are a risk everywhere around here. There's a fine line for people who enjoy outdoor recreation in bear country between being safety conscious and being so paranoid they stay indoors. I'm not always sure where to draw that line, and Alaska residents obviously aren't, either. I didn't come all the way up here to just watch videos of bears! On the Anchorage Daily News site we learned about a �Brown Bear Salmon Cam� set up at Katmai National Park southwest of the Kenai Peninsula. Lots of grizzly bears live there but it's expensive and difficult for visitors to reach the park. Now there are four different remote cameras set up in strategic spots so anyone with a computer, tablet, or smart phone (and a good internet connection!) can watch the male grizzlies and females with cubs fishing for salmon in a stream. Jim was able to watch it on his laptop at the BX tonight but I can�t get it to load on my computer with our MiFi in the camper because the signal is too weak. I don't have a laptop that I can take to WiFi hot spots. Here�s the article with a link to the webcam. The photo above, by Tahitia Hicks, is from that page. I love the longer daylight hours in Alaska in the summer. We rather quickly got used to waking up and going to sleep when it's still light outside. The days are getting "shorter," however, as we're 4+ weeks past the summer solstice now. Tomorrow is predicted to be sunny so we have some outdoor adventures planned.